You have to make money to support yourself and you know you need to sell something, but how do you find the right balance between giving away things for free and putting a price tag on something? Relationship marketing is important and giving away valuable content for free is a great strategy, but how much is too much? Can you give yourself out of business? You have to support yourself. If you don’t sell, you don’t make money. If you don’t make money, you can’t keep doing what you do. That means you can’t continue helping people and everybody loses! But finding the balance is tricky. We talk about finding that balance, how people don’t pay for content (they pay for context), and how true value is in the application of information not in the consumption of it. In other words, it doesn’t matter whether what you provide is paid or free—what matters is whether people apply it. It doesn’t really matter whether what you provide is paid or free—what matters is whether people go out and apply it. Get your bills covered so you can afford to invest in giving away free stuff. Make sure the product you create is a response to your audience’s need. You can’t give away everything and expect to stay in business. People won’t take action on your content if they’re not financially invested. The value of information is in its application, not its consumption. Give away your best 10% for free, and people will be likely to invest in the rest. You pay for things that save you time when your time is worth more than your money. Give away the what, sell the how. People don’t pay for content—they pay for context. 03:00 Sean: Cory and I were trying to figure this out. Full price or free, right? Both good. You should sell things. You should give things away for free. Which one should you start with? Ben said something about starting with a paid product, or that’s what it sounded like. 03:19 Ben: It depends on what you’re talking about. If you’re talking about products, that’s different than if you’re talking about services. Thinking about this topic, my mind has been on services, so I would like to flesh out the product side of it a little bit more. 03:41 Sean: We are talking about products today. We’ll focus exclusively on products. You have to make money to support yourself, and you know that you need to sell something to support yourself. How do you find the balance between what you should give away vs. what you should put a price tag on? Relationship marketing is very important. Giving away valuable content for free is a good strategy, but how much is too much? Can you give yourself out of business? 04:14 Yes, you can. I’ve experienced that. We’re talking about content and context, value being in the application of information rather than the consumption of it. 04:38 It also matters that you stay in business so you can keep doing what you do. 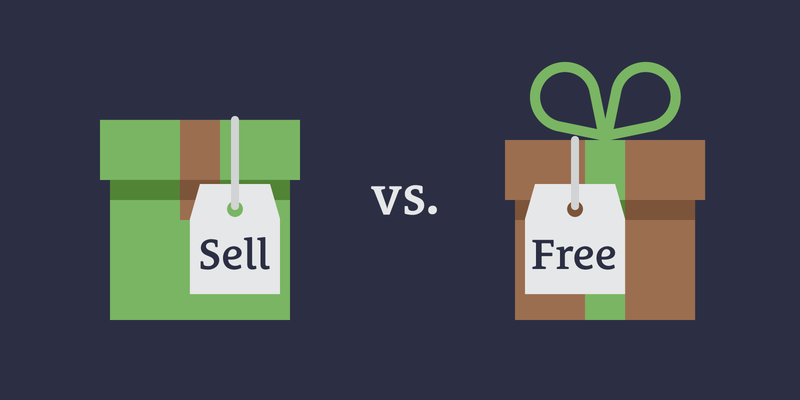 What Should You Give Away vs. What Should You Sell? 04:52 Sean: Let’s figure out where we want to start, because you could start by creating content for people and giving it away for free, or you can start with something paid. I wasn’t completely sure which one you should start with, because I can see pros and cons of both. If you start with free, that’s good. You start to build an audience, people are interested, you can figure out what their struggles are, and you can build things in response to what they’re asking for. 05:53 It all makes sense. Then I started realizing that there are issues with that as well. How do you know that the product you’re making is the right product if you haven’t connected with the people yet, and where do you find the people if you’re not putting out the free content? 06:10 Ben: You can find the people without putting out free content because people are already talking about things within your specific market. It takes some time and research, and it doesn’t give you as complete of a picture as if you were doing your own content marketing. I started off by saying that you should do the paid thing first is based on the principle of the Overlap Technique. Get your bills covered so you can afford to invest before you do the free stuff. 07:06 That has the potential to exponentially grow your business. When it comes to products, you can’t put out free content indefinitely if you don’t have anything to sell. You have to be able to afford to do that. Really, you shouldn’t do that unless you have an end goal in mind. If you are going to do content marketing, your first product may be something you put together based on what you already saw in the market, based on your research. Because you’ve already created it, you have an opportunity to improve on it as you get feedback from your audience. 07:44 Sean: In the startup world, a lot of businesses will start with a free model, free content, something to get a bunch of users. They go for the land grab, and then they try to monetize. They try to figure out what the business model is and how to actually make money from people. They try and shift it. “Okay, we have all of this attention! How do we monetize it?” I don’t actually use Evernote. Do you, Ben? 08:14 Sean: Maybe you know. I heard that they recently went from free to paid. 08:20 Ben: Yes, and it’s a little bit more complicated than that. Because they shifted to that model, they limit the number of devices that can access that account. 08:33 Sean: There’s still a free tier, it’s just more limited? 08:38 Sean: Obviously, they went with the very free route, and apparently, they figured out that they’re not able to sustain themselves. It doesn’t make sense. 08:52 Ben: Me not using Evernote anymore doesn’t have anything to do with whether or not it’s a paid service. There are a lot of different providers out there who do something similar, and this just wasn’t a good fit for what we do. 09:06 Sean: I’m actually really enjoying the iOS 10 Notes app. 09:09 Ben: I haven’t tried it yet. 09:12 Sean: You can have categories in it. You can have notes with photos, headers, bullets, checklists, bold, italics, whatever. You can have drawings in them. They’re rich. You can save clips of things in them from the web or whatever, and it automatically syncs across all of your devices, your Mac, your iPhone, your iPad, and whatever. I actually even use it to schedule out my Instagram quote images. I’ve got a category in there, and I’ll write out all of the dates and the day. 09:48 I just drag the image into the note, and it just uploads it. I type out my caption there. I do a lot of things in there. You can also share and collaborate with people. It will update, not exactly real time, but in a short amount of time you’ll see what someone else has added to the note. 10:10 Cory: You could even put audio recordings in a note. 10:14 Sean: It’s pretty cool. Obviously, to really take advantage of all of that, you have to use your iCloud storage. You can use whatever free storage you have, but eventually you’re going to have to pay for storage. Getting attention first and then trying to monetize it is very common in the startup world, but they can do it because they have venture capital. 10:39 They have investors and they have money that they can use to run their operations, pay salaries, and stuff, even though the business itself isn’t actually generating any income. 11:06 Sean: It may or may not be completely attuned and in response to someone’s struggle. 11:13 Ben: I wonder if the reason that is the case is because a lot of people forego spending the necessary time in the beginning doing their homework, their research. You can come up with a great product if you understand the market your product is for. You don’t have to have an audience speaking directly to you in order to have a good understanding of the market. Once you have a product, that becomes a doorway for you to begin to interact with people. If you’re going to do the free content anyway, why not have a product that you can point people to, but also get realtime feedback on so you can continue to develop and improve on that? 12:18 177 was one of Aaron’s favorites. I think that got him started on realizing that he needed to start making things to sell. He started cranking them out, and that was over 100 episodes ago, but that one is gold. More recently, we did a pair of episodes, 274 and 275. All of those are solid episodes. Check those out. I really encourage you to get a product. The thing with the whole free vs. paid first is that you have to be able to support yourself. If you have venture capital, that’s great. You’re doing just fine. Otherwise, you’re going to have to do some form of overlapping. You can start with free content as long as your bills are covered, so don’t start that way if you’re relying on this for your income. 14:14 He started getting all these great responses, and it shaped his course, the thing he was working on. It changes everything! So often, we start by guessing. We think, “This is how I do it. I guess people probably wonder about this or struggle with that.” We throw it all up there. Source your content material from what people are asking and what they’re going through and it will resonate in a whole new way. It’s really hard to get that without having put out content first. That’s a pro of that. You just have to make sure you have your income taken care of. 14:58 Ben: Yeah. I agree with that, to a point, but I also wonder how necessary it is to wait that long. It takes a lot of time to build an audience that you can have that kind of back and forth communication with. 15:18 Sean: I don’t think you necessarily have to wait. Like I said, those three episodes will get you going on products pretty quick. You probably won’t be able to support yourself full time from your first product right away, and maybe during that time, you could be doing content marketing. That wasn’t the total point of the episode, but we’re opening things up to talk about giving things away for free vs. selling. This is one approach you could take. 15:53 Sean: Try and figure out if there’s demand. That could be done on your own through research without creating content. Or, you can create content and draw the audience you want to reach to you and start having conversations with them. However you do it, you’ve got to figure out if there’s a demand, and you have to build up an audience either way. That’s where content has a little bit of an edge. Even if you build a product first, who are you going to sell it to? The audience building part does come in at some point, it’s just sooner or later. 16:34 In terms of marketing, we talk about giving people what they need in a package of what they want. The package is the marketing. The product actually does need to be what they need. It has to satisfy a need if you want it to be a no-brainer, something that’s really easy to sell. Don’t get that confused and think, “I have to make whatever people want,” because that’s not always what they’ll buy. 18:15 Later on, they said, “The bristles have to be the right balance for your gum tolerance,” so there have been all these innovations and changes as the toothbrush evolved. Designwise, if they went with something that was exactly what that toothbrush needed to be to perform the function that their customers needed, if it looked so different from the original design of the toothbrush, it’s going to be difficult for people who are used to what the toothbrush looks like today. They’ll think, “That doesn’t look right.” They’re used to something else. 19:43 Sean: Bill Gates is, I’m pretty sure, quoted as saying, “No one will ever need 256 MB of RAM.” Yikes. No one will ever need more than this! 20:02 Sean: That was well before the exponential curve in innovation with computers. Don’t just give people what they need as is—give them some context. 20:29 Maybe that means letting version one not exactly do what you would like for it to do for them, but it’s palatable enough in the market that it can catch on, and you can begin to shift them to what they really need. 20:46 Sean: You’ve built this product, whatever it is, and maybe you have an audience or maybe you don’t, but either way, you’ve got to find people to buy this thing. Either way, you have to start marketing it. We’re fond of content marketing. If you’ve got a bunch of money, you can spend money on advertisements to drive traffic, and you can sell things that way, but you have to have money upfront. If you have time instead of money, you can spend that time doing content marketing. 21:18 You have to make sure it’s the right investment, because if you could spend that time elsewhere to make money and then hire someone to do content marketing, that’s another option for you. When it comes to information products, especially, I recommend giving away your best 10% for free. You think, “Okay, that’s cool, I’ll give away 10%. I get it.” Then there’s the best 10%. You’re like, “I don’t want to give away the best!” I was sitting in the beanbag yesterday, and Cory and I were brainstorming podcast episode topics. 21:59 I said that there was one that I felt was giving away too much. We’re about to do this episode that is something I teach in Supercharge Your Writing, and I was like, “Cory, it’s too much to give away!” It was one 34th of the entire master class, but I felt like it was too good. Cory said, “It’s only going to be free for a week.” Give away your best 10% for free. Why? If you give away your best 10% for free, people will have a great experience with your content and they’ll be likely to invest in the rest. 23:18 Give away the best 10% for free, even if it hurts. You should still do that. Find ways to give it away. If you have a written course, give away the best lesson or couple of lessons. If you have a book, give away a chapter. You can even repurpose across different mediums. How could you turn a chapter of your book into a video and give away that video? 23:43 Ben: I was thinking about the kind of content marketing you do, and I want to be careful. We see a lot of people out there who seem to be successful selling products, and they’re putting out free content. We automatically assume that their free content is directly connected to the kind of success that we see. Don’t base what you’re going to put out for free based on what you see others do, because you don’t know what the correlation is between the kind of content they’re putting out and how successful they are. 24:28 You have to make decisions based on what you can afford to do and what is going to represent your brand well. You may be great at writing articles and stuff like that, but you’re terrible at putting together videos right now. That doesn’t mean that you never put out videos, but if it’s going to create a negative association for your brand, you might want to wait until you can afford to hire someone to do that for you professionally. We see so many other people that we look up to putting out content regularly. How Good Do You Have to Be to Start? 25:09 Sean: I hear two things in that. One, I’m curious if you can help me clarify a little bit. How do you balance what you just said, Ben, with getting started with what you have? For instance, seanwes tv looked far worse in the very beginning than it did 180 episodes in. 25:30 Ben: In the beginning, it was still, in terms of the quality of what’s out there, a very high quality. I don’t think anybody would argue with that. 25:42 Sean: Maybe that’s just my perspective. The lighting was terrible. The audio was horrible. 25:48 Ben: You’ve got what the market considers professional standards plus your own standards, and if you fall a little lower, you’re still above that line. 26:03 Sean: How does someone know if they’re above that line? 26:06 Ben: You have to get feedback, I think. Ask other people to look at your stuff, qualified people. You should join the Community. 26:29 Sean: The people here know how to be tactful and not just tell you what you want to hear, but not in a way that’s going to crush you. Unless you choose the “crush me” option, and we’re happy to oblige. 26:51 Ben: The people here also understand that it’s not about their subjective opinion. They understand that it’s more about whether this will accomplish your goals and whether it’s professional enough from an objective standpoint. Early on in the life cycle of your brand, there’s more room for not being as professional. 27:18 People expect that. You have to balance that as well. Even then, there’s still a quality threshold that you want to meet before you let that content represent your brand. 27:35 Sean: You had another good point, Ben, which was not to automatically copy what other people are doing. They may not know what they’re doing, like us, not too long ago. Once upon a time, there was a seanwes podcast. They gave away all of their episodes for free, and everything was good. They lived happily ever after. 28:17 No, it was not happily ever after! At the beginning of 2016, and many times in 2015, we were very close to going out of business. Why do you think we were close to going out of business, Cory? 28:34 Cory: We gave everything away. We didn’t have a clear and defined business model. 28:43 Sean: So giving everything away for free is not a business model? 28:48 Cory: Not if it’s everything. 28:49 Ben: It’s definitely a model, but it’s not a business model. 28:55 Sean: What is it a model of? 28:56 Ben: It’s a model of being very generous for a short while and then not being able to do so anymore. 31:40 “When I joined, I thought it was going to be this treasure trove of value, but you had already given it all away on the front end, so there wasn’t this big store of things for me when I did join. Meanwhile, I had a friend listening who wasn’t ever going to join, because he’s just enjoying it.” We were not allowing people to compensate us so we can stay in business. Everyone was just going about their life and listening to the show, but what if that just stopped? 32:20 It’s just done. That was what was going to happen. How was that good? It’s not good for anyone. It’s not good for us. It’s not good for you. We don’t get to keep doing what we’re doing. I also realized that there’s another downside. When people don’t pay for things, they don’t appreciate them. They don’t actually take action on them. The value of information is not in the consumption of it, it’s in the application. If your content is always there and it’s always free, people will take it for granted. They won’t take action on it because they’re not invested. 32:59 At that point, we changed our model. Not only did we put 400 plus episodes into the Vault, only members get those, and we just have 10 or 12 episodes for free on the public feeds for people to listen to. This episode here doesn’t remain free. You hear it the week it comes out or you have to be a member, because it will go into the vault. Obviously, people can continue to freeload. They could just listen to the latest one, download it, store it away, and be a freeloader. 33:37 The reason we were going out of business was because everyone was, essentially, a freeloader. We didn’t have enough people supporting us to be able to continue doing what we’re doing, and that’s not anyone else’s fault. We gave them that option. Since then, we’ve taken content that used to be free, and we put it into the membership. 34:00 Sean: What do you think happened? Two things happened. Some people got angry. What do freeloaders do when you take away the things they were using for free? They get angry. They’re entitled. Fortunately, only three to five people got really mad. They sent some pretty nasty emails. One person in particular really dug the knife in. They were trying to be creative, thinking about all the ways they could insult me and my character. “You used to be about helping people, and now you just…” They were saying a lot of things. 35:15 I was like, “Wow.” When they say that it’s not about you, it’s about them, it really is true. When people say things, they’re going through a hard time. Fortunately, it wasn’t all that. Two things happened. A few people got upset, and 459 people joined and became members. That’s what happened when we started selling things. The people who joined seanwes membership didn’t just invest in seanwes, they invested in themselves. 36:13 I got so many people saying, “Thank you so much for doing this. Thank you for making me invest.” Inside the membership, you do get access to all the hundreds of podcast episodes. If it feels like, on the outside, we’ve been quiet, it’s because we’ve been focused exclusively on producing member exclusive content. We’ve been cranking out mini courses, doing live training events, and we have guest presenters coming in the next couple of months. Justin has gone completely dark. He’s still dark, working on this epic overhaul of our seanwes talk system. 37:03 We’ve been focusing on the members here, creating exclusive content for them, helping them, investing in them. We’re enjoying that. We get to do that because they’re investing in us. It’s much more than just all of the podcast episodes. It’s the learning paths and the mini courses, like 30 Days to Better Writing, which is a new mini course we’ve come out with. Members have collectively written millions of words now, building writing habits, getting words on the page, finishing their blog posts, getting five months ahead in five minutes on their editorial calendars. If you have free stuff, you can absolutely make it paid. 38:01 It’s totally allowable. Will you get people who are upset? Yes, you will. It’s a part of the deal, but you’ll also get people who will compensate you, and they’ll thank you for allowing them to compensate you. 38:22 Ben: Aaron said, “Are you glad you invested in the membership?” 19 people starred that, and several people said yes. 38:29 Sean: That’s really cool. John’s wondering, “If you offer something free, should it remain free forever to be used as a lead magnet? Or should that have a set lifetime? I am thinking how you currently use introductory pricing that then gets removed down the line. To cause more interest and sign up for the free content/product etc.” That’s absolutely a strategy you can do. I’ve done this with Learn Lettering. 38:58 I had the starter class that was completely free, and then I made it paid. People continue to buy it. We also increase the price of things, and whenever we do that, it’s permanent. Whenever you turn something free into paid, you never go back. Allison was wondering, “Is it ok, once a product has become outdated, to use it in exchange for email addresses? Or does that send a bad message to the people who have bought it for full price in the past?” That would send a bad message. 39:28 That’s the opposite of what we’re talking about, taking something free and making it paid. When you take something paid and make it free, it punishes your loyal buyers. It tells them, “You were stupid to buy from me early, because if you waited, you could have gotten it for free.” You don’t want to send that message to people. If you ever have something that starts free and becomes paid, keep it paid. 39:53 If it started as paid, you keep it paid. Don’t switch it to free, or it sends people the wrong message. 40:22 Ben: That is a good question. If all you’re doing is selling, you’re putting out content, but you’re selling because you have a product, you can squash the momentum that you build with a small audience. That goes against what I was saying earlier about making the product first, but how you go about content marketing is really important. If you create a product and then you’re providing value, you do want to grow your audience to a certain size before you really start trying to sell them on the product. Otherwise, you can push people away. 41:19 Sean: Do you think he should focus on creating a product or continuing to grow his audience? I don’t feel like they’re mutually exclusive. 41:28 Ben: No. If you create a product early, don’t go too heavy on selling it until you’ve grown an audience and have had an opportunity to develop a relationship with them and to understand their needs. If you know the product is the right fit for the right people, you can sell it and sell strong. 42:20 Ben: The way you get there is by developing a relationship with your audience. Even if you do a bunch of research and you understand your market, because you don’t have a relationship with that market and that audience yet, it’s difficult for you to fully understand their needs in a way that allows you to be confident in what you’re trying to sell. 42:51 Sean: Scott says, “Can you please provide some examples of giving the what and selling the how?” That’s something I’ve said before. Give away the what, sell the how. That means that you should give away the overview of the strategy, the big picture, but the how is the practical steps, the best practices, the things to keep in mind while you’re doing the work, how to do the work, and the step by step of everything. Can you think of any other examples of that to make this more tangible for people? 43:40 Ben: One of the things that immediately comes to mind is Expansion Framework. Can we talk about that? 43:47 Sean: Yeah, we can talk about it. It’s a backburner project. 43:53 Ben: I saw what Sean put together on the whiteboard, and I know that he’s talked about it before. I don’t want to recap the whole thing, but essentially, you’re trying to come up with a variety of different products at a variety of different price points, covering the umbrella before you go deep and add more products to a specific price point. That way, you’re spread wider across the market before you try to drive it deep. Sean explained all of that. You could spend 30 minutes talking about what that looks like. 44:40 Sean: We’ve got that recording coming out, by the way. I did this on a live training event back in August, and we’re making those recordings available to members. This was a bonus segment. For half an hour after a live training event, I went exclusively on breaking down the Expansion Framework. We’ll make that it’s own separate video for members so they can get to it and find it quickly. The Expansion Framework is a road map to making $100,000 a month. 45:17 Even if you come up short on that, that’s obviously well worth your membership right there. We also have an episode on creating your first product that, alone, is worth around $2,000 (Related: e177 How to Determine What Your First Product Should Be). If you’re a member listening right now, go back to episode 177. It’s solid gold. Any one of these things automatically pays for your membership. 45:48 Ben: Looking at what you drew on the whiteboard was already sparking ideas, and it created enthusiasm and excitement, and those things are valuable. 46:23 Sean: In what order, how long do you spend on each one, how do you market it? 46:28 Ben: Those are the deeper questions that you should have to pay for. The idea is great, but when you fully understand the how and you can apply it to your own industry and what you’re doing, that’s when it really becomes something you can make money off of. 46:51 Sean: You can also make money off of the what, too, especially if you’re really creative. Oftentimes, the how is well worth investing in. 47:03 Ben: It gets you there a lot faster. 47:04 Sean: It really does. I did a whole episode on the Lambo Goal podcast called Invest in Yourself, and it was about when you should pay for education vs. getting it for free. How do you figure that out? 47:29 We can all theoretically get an infinite amount of money. That’s the potential upside, the ceiling, but we will never get more time. As you go through your life, if you’ve been investing in yourself and building up assets for yourself, eventually, it’s easier to realize that time is your greatest asset. If you have the ability to deploy that against things that will make you a significant amount of money, you understand the value of paying for your time and the value of one hour of your time applied to the right thing. 48:09 You start paying for time. “Someone go wash my clothes. I’ll give you $300.” You think, “What a sucker! I pay 50 cents to wash my clothes, and he wants me to wash his clothes for $300 or deliver him a meal for $18 or drive him around in an Uber for $19.” For people who aren’t there yet, it seems silly and absurd. It seems like they’re wasting their money. This person understands, “If I apply my hour right now to the right thing, I’ll make $19,000.” That’s the value of the how and saving time. 48:49 Sean: Eugene was asking in the chat earlier—he has an issue with paying for education—he said, “Back in the day, people used to just pass down their knowledge for free.” That still happens. Parents do it. Grandparents do it. Communities do it. Mentors do it. 49:09 Ben: There’s a ton of free information out there. 49:13 Sean: Now, through the internet, like Ben said, there’s a ton of free information. Gary Vaynerchuck can be your mentor, if you want. He puts it all out there. You just have to sit there and watch the videos. If he was mentoring you in person, you probably shouldn’t be asking questions anyway. Anyone can be your mentor! There’s tons of free content out there, but people don’t pay for content—they pay for context. 49:45 Someone said, “Everything Sean has said, I’ve heard before.” Nothing new under the sun. Sean’s just another guy. First of all, I agree with you. There’s nothing new under the sun. There is all kinds of content out there for free. Any one thing I have said is probably out there somewhere for free, but are you going to find it? Also, are you going to apply it in your life, contextually, at the right time? Are you going to be able to find the next step immediately? More than likely, you’re running around listening to podcasts, watching videos, reading blogs, newsletters, downloading guides, going through free courses, etc. 50:40 You’re consuming all this free content. You’re watching YouTube videos. You get a little nugget out of a video and you click a recommended video to go somewhere else. Maybe that’s got a little nugget. Maybe that’s the next step, or maybe it’s not. Maybe it’s kind of a side step. Maybe they have a different philosophy, they have a different context, or they’re in a different place, and what they say doesn’t really apply to you. These things don’t go together. 51:08 It’s that image we had on our Value-Based Pricing live event. I’ve got the two chairs. The Herman Miller Aeron chair is very nice. It’s well crafted. If I were to try to make a chair myself, it would not be very nice. We showed an image of a chair that was a bunch of different sized logs, knots sticking out of them, sticks and twigs. You’ve got to be careful when you sit down! There are nails in it. 51:47 It wasn’t really lined up. It looked terrible, horribly uncomfortable. It would probably screw up your back. It was not good. That’s the result of what someone has cobbled together. They found logs and sticks and pieces here and there, nails and a hammer, and they just cobbled it together. The result is not great. That is a cobbled together, free, online education in a lot of cases. You don’t have all of the pieces that you need. You’re not actually paying for the content, because you can get that content elsewhere for free. Free online education is all about finding the information, hoping the source is reputable, and trying to find the next step without wasting time. 52:34 You’re going to waste a ton of time. You’re going to go down a lot of rabbit trails. If you don’t believe me, look at the design contract you’ve used for years that’s comprised of six different random contracts from templates you’ve found, pieced together into this thing that you hope will scare a client into taking you seriously, even though you know there’s no chance in the world that it will stand up legally. 52:58 Ben: But I hope it does. 53:01 Sean: You’re not paying for content. You’re paying for context. I trust the source. From your perspective, for a person you’ve defined where I feel like I fit that description, give me the steps and break down the order, and tell me what to do based on your experience. That is context! The value is in applying what you learn. You’re not going to get any results unless you apply it. How can you apply it if it’s not the right advice for you at the right time? 53:36 Ben: We were having brake issues with our van, and I went and bought the parts myself and thought, “I’m going to change out my brakes.” There are tons of videos out there about how to change brakes in a vehicle—general, vehicle specific… I could spend time watching any one of those, and I could probably find some of what I need to know to change the brakes on my 2007 Honda Odyssey EX. Because there’s a video out there specifically about a 2007 Honda Odyssey EX, that’s the context I need. It goes through every step and what I’m seeing is identical to what I’m experiencing. 54:24 To do anything else would be a waste of time. That happened to be free. I was able to look it up on YouTube, but if that didn’t exist for free somewhere, I would go to the Honda website to see if they had a video on how to change out your own brakes. I would pay money just to watch that one video, so that I wasn’t getting bad information looking at some video that didn’t have to do with my specific vehicle. 54:54 Sean: What if you were looking at a video of a vehicle that was slightly different from yours, and you repaired it in a way that wasn’t good, and then there was greater damage? 55:05 Ben: Or the brakes didn’t work! 55:20 Sean: What’s the way you see it, Cory, when it comes to nothing being new under the sun? 56:57 There’s a demand for this, a market for this. I could try and make some money. I don’t plan on doing that right now, but who knows? Right now, I’m putting out free content. Maybe later there will be demand for a paid product. 58:01 Sean: John asks, “What are the most valuable types of freebies you can give? What do you find converts best based on the free content, courses, guides and products that you have given for free?” Whatever the most valuable thing is for the person, that’s probably going to do the best. To give you a little bit of history, a recap of what’s worked in the past, what people have used, and what works now, in the past, people would do free reports. 58:31 It was kind of positioned as this valuable thing, because reports usually take time, money, and research. The results are something that comes from a lot of work. They’re usually paid, so the fact that it was a free report was a cool thing. It was really overdone, so that stopped working as much, so then people went all in on eBooks. It was great, when they used to be rare. People were making a book available digitally! Then people started calling pretty much anything and everything an eBook, and it got overdone. 59:35 Sean: A book? No way! 59:37 Ben: We were walking out of HEB last night, a local grocery store, and they had a kiosk up with a guide to the 2016 hurricane season, or something like that. It was just a two page fold thing, and I don’t particularly care, but it’s a guide. I can flip through a guide. Even with information that people don’t particularly care about, that doesn’t make so much of a difference for them, they’ll think, “I need to be entertained, diverted, or distracted for a second. Give me the guide.” How much more for something that actually adds value to their life? 01:00:28 Sean: Finally, as well as those do, what is more recently doing very, very well is online courses. If you give an online course, people don’t even see it as a lead magnet. That’s the crazy part. Everyone gets it. They’re like, “Alright, you want me on your email list. What’s the freebie? What’s the opt in? What’s the lead magnet? Please don’t give me one of those splash page overlays. ‘Sign up for my email list or you hate kittens.’ I hate those!” People are done with that. When was the last time you gave one of those things your good email? 01:01:22 Ben: Isn’t Google even suppressing sites that use those kind of tactics? 01:01:26 Sean: It is, yes, finally. We’ll see if people pay attention. If you do an online course, people don’t see it as a lead magnet—they see it as a free online course. 01:01:39 They’re sold. In the process of registering for the course, people give you their contact information. You have their email. You can send a follow up sequence to them over email that tells them about whatever other offers you have, programs, paid stuff, or whatever. It works just as well as any newsletter sign up, but people are much more inclined to sign up for a free course. Obviously, this is way more intense, costs lots more to produce. You may even be paying for video hosting. It’s expensive. 01:02:17 You really need to know what you’re selling, what your conversion rate looks like, what your customer acquisition costs are, and whether this really makes sense for you. If you can do that, online courses do incredibly well. As a little preview, at long last, we are finally going to come out with the Audience Building course. It’s something I’ve been talking about for a long time. I wanted to do it, and it was kind of around the time when I was giving away too much for free. I already promised that this course is going to be free. 01:02:54 Old Sean! New Sean still keeps old Sean’s word. I have to. It’s still going to be free, it’s just a question of when we can do it and give away even more. The plan is, we’re going to produce this course as if you’re paying $199 for it. That is going to be our flagship thing. It’s kind of like inside baseball. I want you to go to seanwes.com. I want you to sign up for it. Right now, it’s an email sign up. We’ll give you five free episodes, and that’s cool. Do you know what’s even more cool? Our free course is going to give people a sense of our paid material. 01:04:02 This is one mini course of a bunch of other ones that they can get access to. Yeah, you could buy something like this! We’ll sell other mini courses separately. Or, they can become a member and get access to everything, to all of these courses, Learning Paths, the entire Vault, the Community, the live shows, everything. I’m being meta here, telling you about my strategies for your educational value. 01:04:46 Ben: This was something that Shawn Blanc did and I really liked it a lot. It got me hook, line, and sinker. He did a video course dolled out over email. It was an email campaign, so you open the email, read a brief description, and you click on the link to watch the video. I went into it thinking, “He’s just giving this away.” I knew there was probably something, but I was so focused on the material and it was such great information that by the time he got to the end of it and he was upselling to something else, I was ready to go. 01:05:23 I didn’t end up purchasing it because I didn’t have the money to do so at the time, but otherwise, I was ready to go. It’s not easy to put something like that together, but it’s simpler than doing a full-blown course or putting together some other big information product. 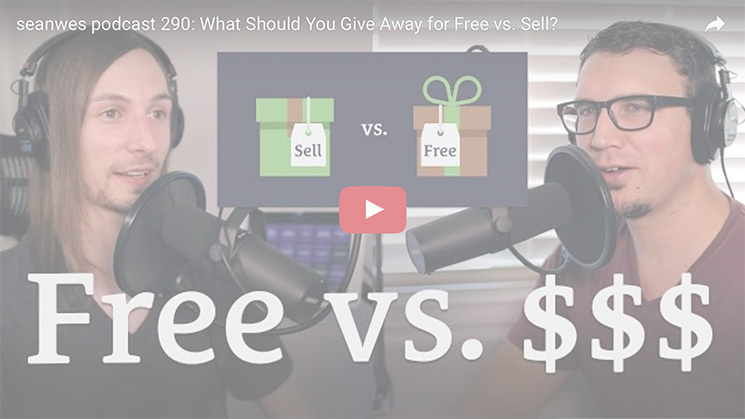 01:06:29 Sean: John asks, “What’s the biggest lesson you’ve personally learned from giving things away for free vs. selling what you make?” You can’t give it all away for free and stay in business. You can choose to stay in business and give away some things for free, but if you give away everything for free, that’s not a business. I knew that, of course, but I was playing far too long of a game, one that I wasn’t going to be around for to reap the rewards. That’s probably the biggest lesson for me. 01:07:08 Ben: It also doesn’t make sense to do everything at once, even if you are in a position to give away a bunch of free content. You shouldn’t say, “I’m going to do a blog, a newsletter, videos, a podcast…” and overwhelm yourself by trying to get into all of these mediums at once. 01:07:33 Sean: Overwhelm myself? I would never do that. I would, I was talking about it in the chat recently. I was talking with John in the chat, and he was like, “How do you overcommit so much without feeling overwhelmed? How are you still fine?” I was like, “No, I overwhelm myself.” I am a chronic procrastinator. I procrastinate on everything. You just wouldn’t know it, because I overload myself so much with so many things. If I can get something done in three hours and I have 12 hours to do it, I won’t do it for nine hours, and then I’ll do it for three hours. 01:08:48 Ben: You won’t do it for 10 hours and you’ll do it in two hours. 01:08:51 Sean: Sure. I’m pretty realistic. Instead of wasting the nine hours, I’ll commit to four things that take three hours. Then, I’ll do each of them in two hours. I’m in a constant state of overwhelm, back against the wall. I don’t give myself a choice, because if I do, I choose not to do it until I have to. 01:09:30 Sean: It’s different personalities. 01:09:32 Ben: Yeah. That’s me. 01:09:35 Sean: I’m not prescribing this, by the way. It’s like #honesthour. 01:09:39 Ben: If I’m overloaded, I freeze. I’m not sure what to do first. I know that I can’t do all of the things. 01:09:52 Sean: Cory and I have meetings about that. I sit in the beanbag, we look at the list, and then we break it down to see what needs to be done first, what’s the priority. My problem isn’t that I overcommit and things fall through. I overcommit and then I do all of it. 01:10:32 I was telling John that you don’t see all the things that I don’t do. Some of those things are good things. I haven’t been hitting all of my runs in the morning. Even if I go to bed on time, if I work from 4am to 9pm consistently, even if I’m getting those six hours of sleep, I don’t really want to get up at 4am and run. Today, I slept in until 5am, and I didn’t run. I got a lot of work done, but that’s not great. I have this growing mound of books on my nightstand, next to my bed, and I keep buying more because I think it will make me want to read. It doesn’t work. 01:11:18 I do want to read. I think it will make me read, because I bought it. I’m not reading enough. I have, in the past year or more, prioritized spending time with Laci, so we will go on a date a week, if not two dates a week, which I feel is really good. What comes after that, which means that it doesn’t happen, is any time for me. I have literally no time to sit, think, read, process, let alone make music, go through the dozens of articles on my Instapaper, the dozens of videos saved in my YouTube, or the dozens of lessons in these $1,000 programs that I’ve bought. 01:12:08 There is no time. Sabbaticals save me from completely burning out, but it’s still not a good place to be. You have to have more time for yourself, and that’s what has been falling by the wayside for me. You see me commit a bunch and follow through a bunch. My output is really good. I’m prolific. You don’t see all the other things that I’m not doing. That’s why I don’t prescribe it. 01:12:42 Ben: Don’t do all of the things at once. 01:12:47 Sean: That was from John. I hope you enjoyed that, John, asking what the biggest lessons are that I’ve personally learned. I’ll get real with you, man. The other thing is that I don’t really have friends. All of my friends are people that I work with. All of my friends are people that I pay. Then I realized, all of my paid work friends, aka employees, the good news is that all of those relationships started as friendships. We’re good. Do You Have to Re-Train Your Audience? 01:13:34 Sean: Pam asks, “How do you re-train your audience to buy stuff from you when you’ve been giving it all away for free too long?” I know you had some thoughts on this, Ben. 01:13:58 Ben: I had originally said that you make them buy from you first, but I was thinking in terms of services more than I was products. For products, going back to the discussion we were having earlier, it really depends on the kind of product you’re creating, how much you understand about that market, whether or not you’re willing to come out with something that isn’t the best version of that product and iterate after the fact… Let’s say, for example, that you’re doing the free thing. You’re putting out free content. 01:14:44 The product that you’re eventually going to sell is an information product, or maybe the free content you’ve been putting out is something you’re going to put behind a paywall. Besides communicating with your audience and giving them plenty of notice, I don’t know that there’s a way to train them. Even from the very beginning, there will be people who consume your free content that would be willing to buy it if it was paid. The only way you could know that in the beginning is if you could read their minds. Over time, as you develop a relationship with your audience, you’ll get a better sense of whether people are ready to buy from you. 01:15:28 Flipping the switch takes those people who were already willing to purchase something from you and allows them to do so. That’s kind of what happened with the Community, the Vault, and all of this content that was out there, available for free, that’s now a part of seanwes membership. 01:15:50 Sean: To be clear, for people who aren’t totally up to speed of everything, that’s one aspect of what’s inside the Vault, but there’s a lot of other exclusive content that has been produced, especially for members. It’s not all content that was free and now you have to pay for it. 01:16:11 Ben: Sean, you didn’t necessarily have to train those people. “I know you’ve been getting my free content, and now you’re going to have to pay for it.” There wasn’t a period where you weaned them off of the free stuff. You just let them know that it was going to happen, and then you made the change. The people who were already ready to buy something from you, did. 01:16:37 Sean: If you’re giving away the what, you can always create something where you sell the how. If you’ve been giving away the how, not just the what, you can make the things that you’ve given away for free paid. Or, just go deeper on it. Most likely, you can’t go into course level depth in a few blog posts or a few podcasts. If you can go deeper and provide greater context for a specific person, that’s valuable. The other thing is curation of materials. You have a bunch of free things spread out over a bunch of places. 01:17:19 Something we provide in the seanwes membership are Learning Paths. These are things that would have been strewn all over, that you never would have found. They’re collected together. You want to learn a certain topic—email marketing, pricing on value, building a writing habit, selling a product, building an audience… Here’s a Learning Path for that! You can create an eBook that is a compilation of things you’ve written about in blog posts, in many different random places that are not all together. 01:17:51 Again, people don’t pay for content, they pay for context. I don’t think in any of these cases it’s about training an audience that got stuff for free to buy. I think you just need to make it make sense to them. 01:18:17 Ben: If you truly believe something is going to add value to someone else, you understand that people take action on the things that they pay for. 01:18:32 Sean: You’re helping them. 01:18:33 Ben: You’re helping them. Even if you don’t feel good about the price, if you feel like it’s overpriced, remember that you’re encouraging people to pay so that they take action. The action they take is going to be worth way more than they spend. That’s what you’re doing, so you can feel good about really selling them on it and getting them off of the fence. 01:19:09 Sean: I feel that burn right now, having bought memberships and programs. I’m paying for them. If I had gotten them for free, I wouldn’t even care. I wouldn’t even mess with it. The fact that I’ve invested makes me hungry to go in and take action on that stuff.